18,814 globally. This is the third consecutive year of improvement. The fall in global terrorism is reflected in the index: 94 countries improved this year, with 46 deteriorating – the highest number of countries to improve year on year since 2004. The global economic impact of terrorism was US$52 billion in 2017; a decrease of 42 per cent from the previous year. Deaths in Europe fell by 75 per cent. France, Belgium and Germany had significant improvements. However, Spain deteriorated significantly. Terrorism is still a global phenomenon with 67 countries recording at least one death in 2017. There has been an increase in far-right terrorism in North America and Western Europe, which in 2017, accounted for 59 attacks and 17 deaths. ISIL’s decline contributed to a 56 per cent reduction in deaths in Iraq between 2016 and 2017. However, ISIL remains the world’s deadliest terrorist group. Five countries (Afghanistan, Iraq, Nigeria, Somalia and Syria) recorded more than 1,000 deaths, while 19 countries recorded more than 100 deaths. Somalia and Egypt recorded the largest increases in the number of deaths from terrorism in 2017 – one attack in Somalia killed 587 people and another in Egypt killed 311 people. Deaths from terrorism increased by 93 per cent in Somalia from 2016 to 2017. 67 countries recorded more than one death while 98 countries recorded at least one attack. Angola and Spain had the largest deteriorations in score in the GTI as a result of a single attack in Angola and multiple attacks in Spain. Myanmar and The Philippines recorded a record numbers of terrorism deaths in 2017 with 166 deaths and 50 deaths respectively. Afghanistan recorded the highest number of terrorism deaths in 2017, replacing Iraq. In North America and Western Europe, the threat of far-right political terrorism is on the rise. In the four years between 2013 and 2017, there were 66 deaths and 127 attacks caused in Western Europe and North America by far-right groups and individuals. In 2013, there were no deaths, compared to 17 in 2017. Most attacks were carried out by lone actors with far-right, white nationalist, or anti-Muslim beliefs. 10 countries most impacted by terrorism, ranked by number of deaths (1) Afghanistan (2) Iraq 3) Nigeria (4) Somalia (5) Syria (6) Pakistan (7) Egypt (8) Congo (9) Central African Republic and (10) India. 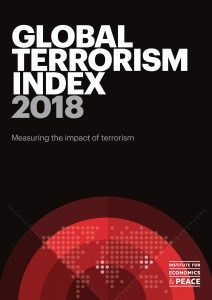 Global Terrorism Index (GTI) The GTI by the Institute for Economics & Peace provides a comprehensive summary of the key global trends and patterns in terrorism over the last 17 years. The report ranks 163 countries (99.6 per cent of the world’s population) according to how impacted they are by terrorism. The indicators include the number of terrorist incidents, fatalities, injuries and property damage. Institute for Economics & Peace The Institute for Economics & Peace (IEP) is the world’s leading think tank dedicated to developing metrics to analyse peace and to quantify its economic value. It does this by developing global and national indices, including the annual Global Peace Index, calculating the economic cost of violence and understanding positive peace. (Source: Institute for Economics & Peace).